FinTech Weekly Magazine features relevant articles on latest issues and trends in the finance sector. The articles are written by professionals from the financial field, providing thoughtful insights into topics that matter today. The contents deal broadly with expert perspectives on the vast possibilities that technology offers for the financial and adjacent sectors. If you are looking for a source for high-quality fintech articles, your answer is FinTech Weekly Magazine. 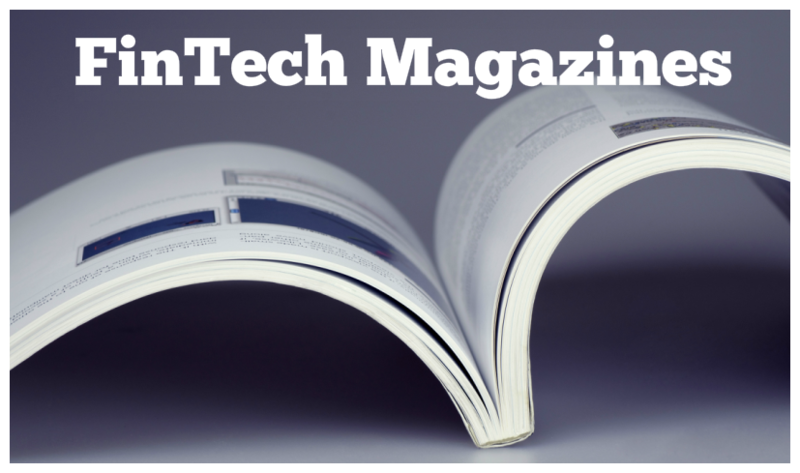 Fintech Finance Magazine is a quarterly publication that heads out to 60 plus events every 3 months. The magazine covers all aspects of the financial market, from branch design to asset management. Each edition features some of the best starts on the world of Fintech and Financial services. Financial technology magazine is Africa’s prime print publications on fintech. It focuses on events, stories and case studies of technologies that enable financial services provisioning through capital markets, insurances, banking and pensions services. The magazine has constantly delivered a premium quality publication to the financial services industry across Africa and beyond. The Startup Magazine is on a mission to be the leading resource of education and inspiration for pioneering early stage startups. The magazine is dedicated to empowering startups with the depth of understanding that is necessary to succeed. To give advertisers value for their money, respected financial technology practitioners and influential industry CEOs write for the magazine as columnists. Disrupts Magazine is a London-based magazine that features great people, amazing ideas , startups culture, and technology. It is a monthly magazine that provides a cohesive voice to the wave of enterprise disrupting the corporate scene today. It brings together the communities of finance, innovative technology, music and art through the lifestyle of entrepreneurship. The magazine enjoys a variety of supporters and collaborators ranging from insightful entrepreneurs, designers, and investors. Elite Business magazine is passionate about championing startups. Interested in startups, the magazine provides fresh perspectives and feature disruptive solutions. They cover shakers and movers that make enterprise exciting. Banking Technology is packed with news, analysis and insights, case studies, research and expert commentary. It is an amazing magazine for tech-savvy users who want to understand how digital only banks operate. Euromoney is an English-language monthly magazine focused on finance, and business. Although this magazine does not only feature fintech articles, it covers news in the banking, finance and technology that are important for fintech. The Banker is a monthly international financial affairs publication owned by The Financial Times Ltd. First published in 1926, the magazine covers the latest UK and International banking, finance and business coverage, and analysis, with exclusive interviews and unparalleled access to the finance. BizTech explores business issues and technology issues that business managers face when they’re evaluating and implementing a solution. The magazine is published by CDW, a leading multi-brand technology solutions provider to business, government, education and healthcare organizations in the UK and America.